Xanthogranulomatous pyelonephritis (XGP) is a rare type of chronic infective pyelonephritis being increasingly recognized as an important cause of renal morbidity worldwide. Schlagenhaufer in 1916 first described XGP, which now globally accounts between 0.6% and 1% of all pyelonephritis cases. It causes renal parenchymal destruction which compromises renal function and involvement of perinephric adipose tissue and peritoneum quite often. It affects all ages, with predilection for middle-aged females and the elderly. The main cause of XGP is chronic obstruction and infection. The condition is usually unilateral and results in a nonfunctioning kidney. Substantial accumulation of lipid-laden macrophages causes yellow nodules in the renal parenchyma often visible on gross examination. Renal parenchymal destruction may be accompanied by fibrosis and the inflammatory process can extend beyond the renal territory. Hydronephrosis and renal calculi are often observed. XGP usually appears as kidney enlargement akin to a neoplasm and hence the nomenclatures of pseudo tumor/inflammatory tumor. The clinical manifestations are varied and radiological imaging too simulates other inflammatory and neoplastic renal disorders. Surgical intervention in the form of nephrectomy is the only definitive treatment. We intend to present our 13 years' retrospective data on XGP including the diverse clinical and histopathological features. The present study is a retrospective study comprising 40 cases of XGP which were diagnosed on the basis of histopathology findings during a period of 13 years (2005–2017). The study was conducted in the department of pathology, in a tertiary care hospital. Ethical clearance was not taken considering the retrospective nature of the study. Specimens received were total nephrectomy in 38 (95.0%) cases and partial nephrectomy in 2 (5.0%) cases from the urology department of our hospital. Written informed consent was taken from all the patients before nephrectomy. Clinical and radiological details were obtained from the patients' file records. The nephrectomy specimens were fixed in 10% buffered formalin and appropriately grossed as per the standard protocol for tissue processing and paraffin embedding. Sections were cut at 3-μm thickness and stained with hematoxylin and eosin stain. Special stains like periodic acid Schiff and Ziehl Neelsen were done wherever required. The patients ranged from 22 to 75 years of age (mean age: 39.5 ± 13.6 years). Of 40 cases, 26 were female and 14 were male with male-to-female ratio of 1:1.9. Five (12.5%) patients were on antihypertensive medication. All the patients had unilateral disease with predilection for the right kidney (25/40 cases). Flank pain was the commonest presenting symptom, seen in 37 (92.5%) cases followed by fever in 25 (62.5%) cases and dysuria in 19 (47.5%) patients. Renal angle tenderness was elicited in 16 (40.0%) cases and a lump was palpable in 12 (30%) cases on per abdomen examination. Ultrasound examination was done in all the cases. Computed tomography (CT) scan was available in 36 cases. Contrast enhanced computed tomography (CECT)/Intravenous pyelogram (IVP) [Figure 1]/Diethylene triamine penta acetic acid (DTPA) were done to assess the functional status and nonfunctioning/poorly functioning kidney was detected in all the cases. On ultrasound – KUB, an enlarged kidney with disappearance of its normal architecture and inhomogeneous echogenicity was seen in all the cases. Dilated pelvicalyceal system, large amorphous central echogenicity, multiple fluid-filled masses, and contracture of the renal pelvis were visualized in most of the cases. In addition, renal space occupying lesion (SOL) was suggested in two cases. CT scans available in 36 cases showed areas of low attenuation, parenchymal inflammation, hydronephrosis with expansion of renal calyces, and perinephric fat accumulation in all the cases. Contracted renal pelvis was seen in 32 cases while perinephric/peripelvic/post-ureteric stranding was observed in 30 cases. Thickening of renal fascias was noted. Obstruction caused by calculi in renal pelvis was seen in 36 (90%) cases, of which 24 cases had staghorn calculi. One case had a ureteric calculus. Note was made of the renal SOLs in two cases suspected to be neoplastic. Urine culture reports were available in 34 cases and growth observed were of Escherichia More Details coli (15), Proteus mirabilis (8), and Klebsiella pneumonia e (2). The culture was sterile in nine cases. The diagnoses on the basis of CECT/IVP/DTPA scans were nonfunctioning kidney secondary to pyelonephritis in 22 (55.0%) cases, nonfunctioning kidney with pyonephrosis in 14 (35.0%), and perinephric abscess and renal SOL suspected to be tumor in 2 (5.0%) cases each. Gross examination showed enlarged kidney in all the cases. Perinephric fat was increased in 34 (85.0%) cases. Renal capsule was adherent and external surface showed scarring in 32 (80%) cases. Perinephric fat showed gray brown to gray yellow necrotic areas in two (5.0%) cases. On cut section, dilatation of pelvicalyceal system was noted in all the cases with loss of cortico-medullary distinction and replacement of renal parenchyma by multiple yellow fatty nodular areas [Figure 2]. Necrotic areas with gray tan to gray yellow areas (variegated appearance) were seen. In addition, multiple pus-filled abscesses were seen in eight (20%) cases. Two (5.0%) cases showed focal gray tan areas of hemorrhage. In two (5.0%) cases, renal tumors were seen. One measured 6.0 cm in diameter and involved the upper pole of the kidney with gray yellow to gray tan cut section. The other tumor measured 2 × 2 × 1.5 cm and involved the renal pelvis. This tumor was friable, with focal papillae. Nephrolithiasis was seen in 14 (35.0%) cases on gross examination. In rest of the cases, the stones were handed over directly to the patients' attendants postoperatively. Attached ureter was dilated with ragged inner surface in eight (20.0%) cases. One case had a nephrocutaneous fistula where in addition to the nephrectomy specimen, fistulectomy specimen was also received. On microscopy, representative sections examined showed granulomatous mixed inflammatory cell infiltrate. Sheets/Aggregates/Nodules of xanthomatous histiocytes with an admixture of neutrophils, lymphocytes, and plasma cells in variable numbers were seen [Figure 3]. Multinucleated histiocytic giant cells were noteworthy. Areas of fibrosis were also seen. 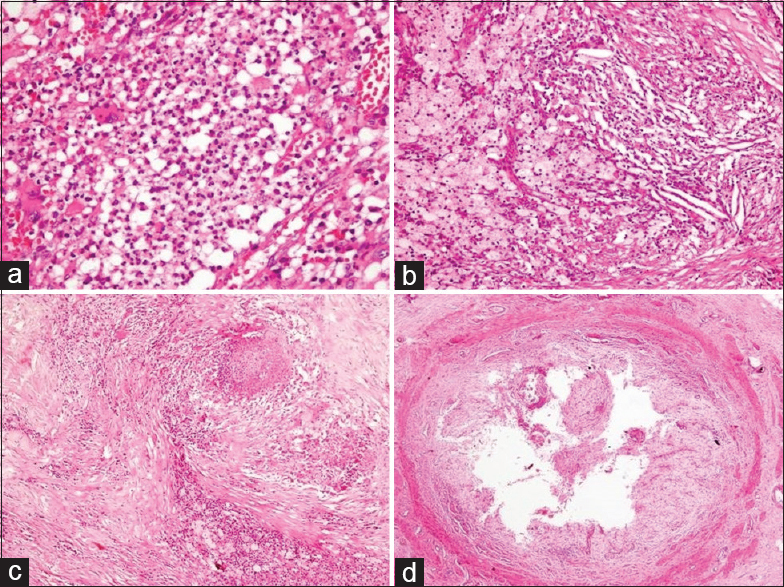 In addition, lymphoid aggregates with germinal center formation (21, 52.5% cases), cholesterol clefts (19, 47.5% cases) [Figure 4], areas of hemorrhage and necrosis (11, 27.5% cases), foci of calcification (8, 20% cases), and cholesterol granulomas (5, 12.5% cases) were noted. Abscess formation walled off by chronic granulation tissue was observed in 10 (25.0%) cases. Renal parenchymal involvement in XGP was diffuse in 31 (77.5%) cases and focal in 9 (22.5%) cases. The inflammation was seen extending into perirenal fat in three (7.5%) cases. Background showed changes of chronic pyelonephritis characterized by periglomerular fibrosis, tubular atrophy and thyroidization, interstitial fibrosis, and chronic inflammation. Features of chronic ureteritis in form of partly ulcerated transitional lining, mural fibrosis, and mild-to-moderate lymphomononuclear cell infiltrate were noted in 11 (27.5%) cases. Sections from renal blood vessels were largely unremarkable barring changes of hyaline arteriosclerosis noted in nine (22.5%) cases. In one case, changes of diabetic nodular glomerulosclerosis were seen in addition to XGP where the glomerular deposits were positive on periodic acid Schiff staining. In two (5.0%) cases, with renal tumors detected in the same kidney, one was conventional renal cell carcinoma (RCC) (Fuhrman nuclear grade 2) composed of cells arranged in nests, acini, and focally as tubules [Figure 5]. The cells were uniform with clear cytoplasm, prominent cell membranes, round to oval nuclei, and tiny nucleoli. Sections from the adjacent renal parenchyma showed features of XGP. Other case showed papillary urothelial carcinoma, low grade with changes of diffuse XGP in the adjoining renal parenchyma. Overlying capsule, perinephric fat, ureter, and renal vessels were free of tumor in both the cases. Histopathological diagnoses rendered were XGP in 23 (57.5%) cases, XGP with pyonephrosis in 10 (25.0%), XGP with perinephric abscess in 3 (7.5%); XGP with diabetic nodular glomerulosclerosis, XGP with chronic nonspecific fistula, renal cell carcinoma (clear cell type) in a background of XGP, and papillary urothelial carcinoma, low grade with XGP in 1 (2.5%) case each. XGP is an uncommon variant of chronic pyelonephritis with 1.4 cases per 100,000 population being recorded per year. Three forms of XGP, diffuse, focal, and segmental, are recognized. Renal parenchyma destruction by granulomas, abscesses, and lipid-laden macrophages is observed., It is seen essentially in all age groups, but most frequently presents in middle aged to elderly patients. The mean age varies from 45 to 55.2 years. XGP has a female predilection. In our study too, female preponderance was seen with a male-to-female ratio of 1:1.9 and mean age of presentation was 39.5 years. The lesion is generally unilateral and more often involves the right kidney. Bilateral lesions, although rare, are on record and invariably have a fatal outcome. Twenty five of total 40 cases had involvement of the right kidney in our study with none of the cases having bilateral involvement. Clinical symptomatology of XGP is often nonspecific with fever, flank pain, palpable mass, malaise, anorexia, and weight loss being commonly observed., Dysuria, frequency, pyuria, or hematuria may be experienced. Abscess formation (paranephric and psoas), fistula formation (renocutaneous and renocolonic), and sepsis are known complications.,,, In the present study, pyonephrosis and perinephric abscess were seen in 10 (25.0%) cases and 3 (7.5%) patients, respectively, and one case had nephrocutaneous fistula. Few patients may develop hypertension or hepatomegaly. Ischemic colitis and emphysematous pyelonephritis are reported albeit extremely rare., All the patients were symptomatic in the current study and the most common symptom was flank or abdominal pain followed by fever and dysuria. Hematological and biochemical alterations like anemia, leukocytosis, raised Erythrocyte sedimentation rate (ESR), proteinuria, high fasting blood glucose, azotemia, elevated alkaline phosphatase, raised aspartate aminotransferase, and hypoalbuminemia can all occur which are again not specific for XGP. Radiologically, ultrasound examination in diffuse XGP reveals kidney enlargement, disappearance of its normal architecture, large amorphous central echogenicity, multiple fluid-filled masses, hydronephrosis, and contracted pelvis.,, Ultrasonography findings in focal forms of XGP are nonspecific. IVP and DTPA renal scans are informative on the renal functional status. A fairly reliable radiologic diagnosis of XGP can be made on CT. Three stages of diffuse XGP, stage I (nephric XGP – confined to renal parenchyma), stage II (perinephric XGP – involvement of perirenal space, Gerota's fascia), and stage III (paranephric XGP – involvement of pararenal space, retroperitoneal structures), have been described. XGP is a diagnostic dilemma preoperatively as the clinical and radiologic findings imitate both benign and malignant lesions., Histomorphology is pathognomonic with diffuse granulomatous inflammatory cell infiltrate. There is an admixture of lipid-laden foamy macrophages, neutrophils, lymphocytes, plasma cells, and giant cells. In addition, cholesterol crystals, fibrosis, a variable degree of renal tubular atrophy, tubular dilatation, focal squamous metaplasia of the urothelium, microabscesses, lymphoid aggregates with germinal center formation, and spindle cell proliferation can be observed. In our study, similar findings were noted and diffuse renal parenchymal involvement was seen in majority (31, 77.5%). The histomorphologic differentials include renal cell carcinoma with sarcomatoid features, leiomyosarcoma, Wilm's tumor, lymphoma, malakoplakia, megalocytic interstitial nephritis, pyelonephritis, tuberculosis, and perinephric abscess.,,, The benign entities, malakoplakia and megalocytic interstitial nephritis, can be excluded by observing cytoplasmic periodic acid Schiff-positive, diastase-resistant material in the histiocytes. Michaelis–Gutmann bodies are characteristically seen in malakoplakia. A critical evaluation of sections reveals epithelial and atypical spindle cell component in sarcomatoid RCC and interlacing bundles of spindled tumor cells with blunted nuclei and ample eosinophilic cytoplasm in leiomyosarcoma. Mitotic activity is seen in both. Lipid-laden xanthomatous cells of XGP may mimic the clear cells of clear-cell RCC. Exuberant foamy histiocytes may also be seen in papillary RCC. The xanthomatous cells have a foamy cytoplasm compared with the more cleared cytoplasm of tumoral clear cells. Immunohistochemistry (IHC) may be helpful in certain cases. Sarcomatoid RCC shows at least focal positivity for cytokeratin and epithelial membrane antigen. Leiomyosarcoma is diffusely positive for desmin and smooth muscle actin. Clear-cell and papillary RCC show good positivity for CD10 and epithelial membrane antigen. The xanthomatous cells and macrophages in XGP show positive cytoplasmic staining for lysozyme, diffuse positivity for CD68, and vimentin. 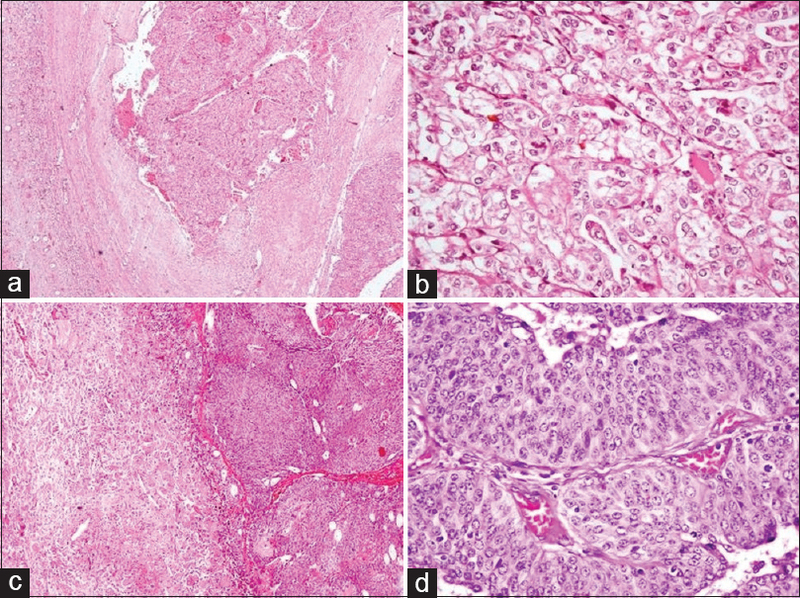 IHC is extremely useful in cases with coexistence of XGP and tumors which is a rarity. Two of our patients had tumors, RCC and urothelial carcinoma concomitant with XGP in the same kidney. XGP is a rare variant of chronic pyelonephritis with progressive loss of renal parenchyma resulting in a nonfunctioning kidney. Histopathologic examination gives the definitive diagnosis which relies on the characteristic morphology. The treatment of choice is nephrectomy for the more common diffuse forms. Siddappa S, Ramprasad K, Muddegowda MK. Xanthogranulomatous pyelonephritis: A retrospective review of 16 cases. Korean J Urol 2011;52:421-4. Lintong PM, Durry M. Xanthogranulomatous pyelonephritis. MOJ Clin Med Case Rep 2015;2:1-3. Das DP, Pal DK. Co-existing malakoplakia and xanthogranulomatous pyelonephritis of kidney: Two different spectrum of same disease process. Urol Ann 2016;8:252-4. Loffroy R, Guiu B, Watfa J, Michel F, Cercueil JP, Krausé D, et al. Xanthogranulomatous pyelonephritis in adults: Clinical and radiological findings in diffuse and focal forms. Clin Radiol 2007;62:884-90. Addison B, Zargar H, Lilic N, Merrilees D, Rice M. Analysis of 35 cases of xanthogranulomatous pyelonephritis. ANZ J Surg 2015;85:150-3. Tsai KH, Lai MY, Shen SH, Yang AH, Su NW, Ng YY, et al. Bilateral xanthogranulomatous pyelonephritis. J Chin Med Assoc 2008;71:310-4. Chandanwale SS. Xanthogranulomatous pyelonephritis: Unusual clinical presentation: A Case report with literature review. J Family Med Prim Care 2013;2:396-8. Li L, Parwani AV. Xanthogranulomatous pyelonephritis. Arch Pathol Lab Med 2011;135:671-4. Al-Ghazo MA, Ghalayini IF, Matalka II, Al-Kaisi NS, Khader YS. Xanthogranulomatous pyelonephritis: Analysis of 18 cases. Asian J Surg 2006;29:257-61. Nandedkar SS, Malukani K, Sakhi P. Xanthogranulomatous pyelonephritis masquerading as a tumor in an infant. Indian J Urol 2014;30:354-6. Chow J, Kabani R, Lithgow K, Sarna MA. Xanthogranulomatous pyelonephritis presenting as acute pleuritic chest pain: A case report. J Med Case Rep 2017;11:101. Yoshino T, Moriyama H. Case of the diffuse form of xanthogranulomatous pyelonephritis. Case Rep Urol 2013;2013:936035. Tüysüz G, Tayfun F, Canpolat F, Zeytun H, Goya C, Keleş AN, et al. A case of xanthogranulomatous pyelonephritis mimicking wilms tumor. Turk J Pediatr 2015;57:409-12. Smith RD, Khoubehi B, Chandra A, Glass JM, Mee AD. Xanthogranulomatous pyelonephritis and renal malignancy: Unusual fellows in the renal bed. BJU Int 2000;86:558-9. Tseng CW, Chen WN, Juang GD, Hwang TI. Staghorn calculi and xanthogranulomatous pyelonephritis associated with transitional cell carcinoma. Urol Sci 2015;26:69-71. 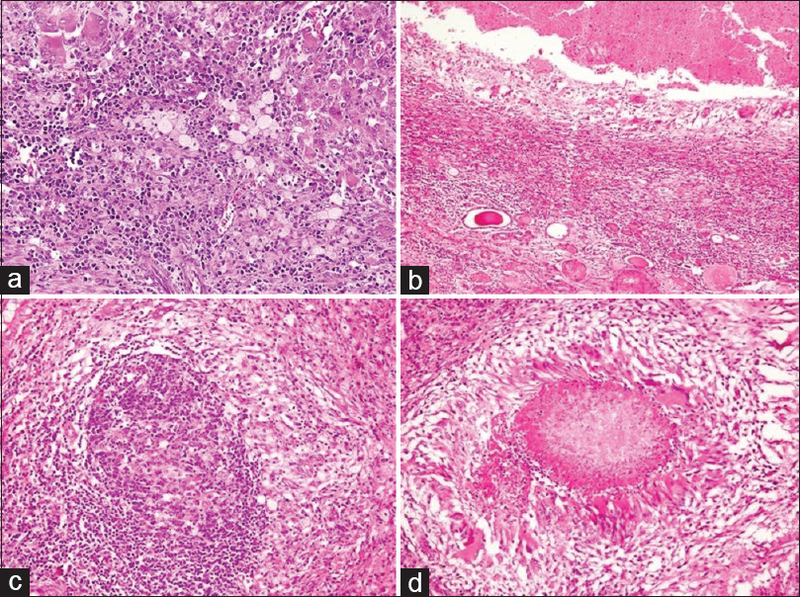 Mardi K, Kaushal V, Sharma V. Rare coexistence of keratinizing squamous cell carcinoma with xanthogranulomatous pyelonephritis in the same kidney: Report of two cases. J Cancer Res Ther 2010;6:339-41. Fallatah A, Tarakji M, Amuesi J. Xanthogranulomatous pyelonephritis: A retrospective study of 10 cases and review of the literature. Saudi J Kidney Dis Transpl 2001;12:520-4. Leoni FA, Kinleiner P, Revol M, Zaya A, Odicio A. Xanthogranulomatous pyelonephritis: Review of 10 cases. Arch Esp Urol 2009;62:259-71. Puthenveetil RT, Baishya D, Barua S, Sarma D. Unusual case of nephrocutaneous fistula – Our experience. Asian J Urol 2016;3:56-8. Alazab R, Ghawanmeh HM, Abushamma F, Ababneh O, Al-Karasneh AI. Spontaneous nephrocutaneous fistula: Rare complication of xanthogranulomatous pyelonephritis. Urol Case Rep 2017;11:44-6. Ghoz HM, Williams M, Perepletchikov A, James N, Babeir AA. An unusual presentation of xanthogranulomatous pyelonephritis: Psoas abscess with reno-colic fistula. Oxf Med Case Reports 2016;2016:150-3. Ott U, Busch M, Steiner T, Schubert J, Gröne E, Gröne HJ, et al. Renal failure, sepsis, and bilateral kidney tumors. Xanthogranulomatous pyelonephritis. Kidney Int 2008;73:787-8. Wen YK, Chen ML. Xanthogranulomatous pyelonephritis complicated by emphysematous pyelonephritis in a hemodialysis patient. Clin Nephrol 2007;68:422-7. Su YJ, Lai YC, Chou CY, Chang WH. Ischemic colitis secondary to xanthogranulomatous pyelonephritis. Int J Infect Dis 2009;13:e89-91. Craig WD, Wagner BJ, Travis MD. Pyelonephritis: Radiologic-pathologic review. Radiographics 2008;28:255-77. Khalid S, Zaheer S, Zaheer S, Ahmad I, Mohd Khalid. Xanthogranulomatous pyelonephritis: Rare presentation of a rare disease. South Asian J Cancer 2013;2:4. Zorzos I, Moutzouris V, Petraki C, Katsou G. Xanthogranulomatous pyelonephritis – The “great imitator” justifies its name. Scand J Urol Nephrol 2002;36:74-6. AlDarrab RM, AlAkrash HS, AlKhateeb SS, AlBqami NM. 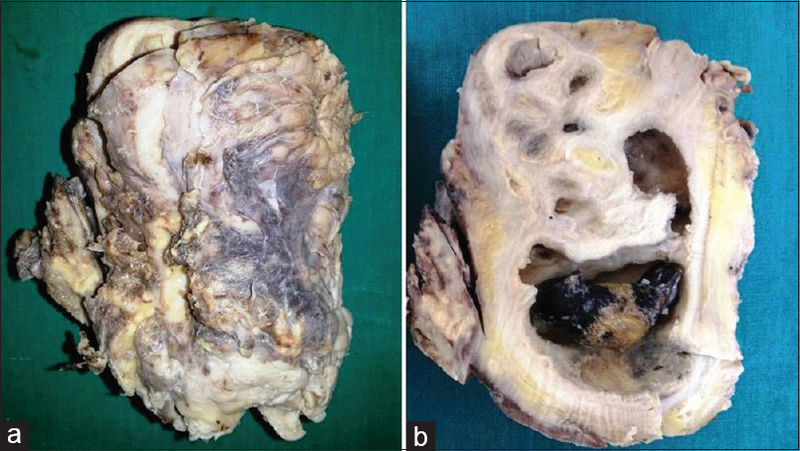 A case report of a xanthogranulomatous pyelonephritis case mimicking the recurrence of renal cell carcinoma after partial nephrectomy. Urol Ann 2015;7:524-6. Dwivedi US, Goyal NK, Saxena V, Acharya RL, Trivedi S, Singh PB, et al. Xanthogranulomatous pyelonephritis: Our experience with review of published reports. ANZ J Surg 2006;76:1007-9.